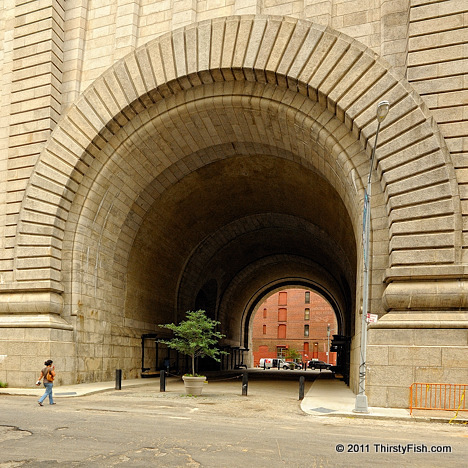 The Manhattan Bridge Archway in DUMBO was reopened for public access after 17 years of closure. In an earlier post, I had written about why the Manhattan Bridge most probably would be everyone's favorite bridge had the Brooklyn Bridge not existed. The anchorages of the bridge were designed with arches for street traffic, which at the time was made up of pedestrians and horse-and-carriages. The bridge was first opened to traffic on December 31, 1909. Photography Tip: Without the person, this photograph would not have a reasonable sense of scale; The over-sized plant-pot in the center does not help. In photos where scale is unclear or confusing, including a person or a familiar object will give the viewer a frame of reference.